Davidia Tree – Worth the Wait? When I first read about Davidia trees, I was immediately fascinated. Imagine finding something that satisfied both my love of flowering trees and my love of unusual plants! It seemed the perfect choice for the long shade border I was creating across my backyard. So, when I found a Davidia involucrata at an end-of-season sale at Weston Nurseries, I immediately bought it. It was small, only about five feet tall, but I had high hopes. I planted it, nurtured it and awaited the grand show. After five years had passed with not a flower in sight, I did some homework. I found that not only was it border-line hardy in my area, but it typically did not bloom for twelve years after planting. It was a good grower and created nice shade; its leaves were attractive and it had lovely bark; I consoled myself as I waited for Year Twelve. Year Twelve came and went. Finally, after thirteen years, I was thrilled when one branch produced some of the most intriguing flowers I had ever seen: fuzzy brown spheres with two white bracts, the larger one nearly seven inches long! This continued for the next couple of years: a branch here and there with a smattering of flowers. But this year, nearly the entire tree is blooming. As the white bracts of each flower flutter in the breeze, I can see why its common names are Handkerchief Tree and Dove-tree. It is just as fascinating as I had imagined. And, yes, it was worth the wait. Plants with variegated foliage add interest and vitality to the home landscape. They brighten shady corners and create a feeling of depth and movement in the shrub border. In addition, they make a noticeable contribution throughout the entire growing season: colored leaves are longer lasting than the longest blooming flower. Variegated plants help bring attention to plain green plants in their midst, by virtue of contrast. Large variegated plants should be selected judiciously. One or two contribute just the right amount of drama and clarification to the shrub border, too many overwhelm. Variegation can take many forms. On some plants, green leaves are splashed or streaked with color, such as yellow, white and pink. On other plants, leaves may be edged with contrasting color. This can mean a green leaf outlined in white, or a white-centered leaf outlined in green. There are many variations on this theme, with purple, yellow and pink combining dramatically with shades of green to produce plants of stunning beauty. One such plant is a variegated form of the popular kousa dogwood, Cornus kousa ‘Wolf Eyes’. This tough, shrubby tree reaches a height of 10-15 feet at maturity and is nearly as wide as it is tall. It is an excellent small specimen tree and is a valuable addition to the shrub border. It flowers in late spring, after our native dogwood. Each bloom is made up of four white, pointy bracts that can last up to 6 weeks. 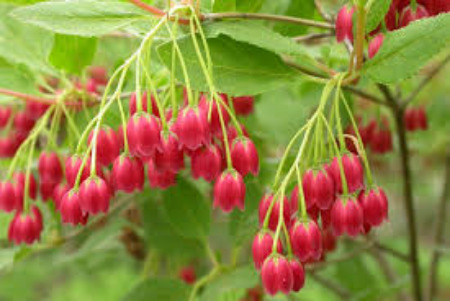 These are followed by red, raspberry-like fruits that are produced in late summer. Like other kousa dogwoods, ‘Wolf Eyes’ prefers fertile, acidic soil that is neither very wet nor very dry. It is considered disease-free and has few pests. Mature trees have mottled, attractive bark that adds to its beauty and provides winter interest. It is the show-stopping foliage of the ‘Wolf Eyes’ kousa that sets it apart. Each 3-inch-long, grey-green leaf is margined with white. This contrasting leaf edging emphasizes the leaf shape: elliptical with wavy, rippled edges. New summer growth is flushed with pink, as are the new branches. Fall brings these pink tones to every leaf, for a distinctive autumn show. I have planted a ‘Wolf Eyes’ kousa in my shrub border, where it simultaneously is accented by and calls attention to adjacent all-green shrubs such as longstalk hollies and rhododendrons. It is a harmonious companion to hostas that echo its white-edged leaf variegation, such as H.’Cherub’ and H.‘Tambourine’. It is complemented by other green-and-white variegated perennials that have distinctly different forms: a dwarf striped grass and a stand of Solomon’s Seal. Grouping different variegated plants can sometimes produce garden chaos, but this collection has a sense of serenity and harmony. This is achieved by casting the ‘Wolf Eyes’ kousa in the leading role and pairing it with plants that either have related variegation or no variegation. Even within a named cultivar, such as ‘Wolf Eyes’, variegation can vary from plant to plant. When I was selecting my tree, I had six specimens to choose from at the nursery. The variegation was slightly different on each one, so leaf pattern was an important consideration for me, as was tree health and branch structure. Ultimately, I chose one that had extremely wavy leaves and green flecks in the white margin. This tree never fails to elicit comments and questions from guests, who find it just as fascinating and gorgeous as I do. ‘Wolf Eyes’ kousa dogwood is as eye-catching as its name suggests. Its stunning variegated foliage, white flowers and mottled bark add drama, beauty and distinction to the home garden and landscape. The Umbrella Pine is actually not a pine at all. It is a coniferous evergreen that is now classified in its own family, the Sciadopitaceae. The Umbrella Pine can be traced to the Triassic period, some 250 million years ago, when the continents were joined and much of North America was near the Equator. At that time, the Japanese Umbrella Pine and its then-numerous relatives flourished in what is now Eurasia, northern Europe and northern North America. But as the continents moved and flowering plants replaced conifers, the Umbrella Pine’s range and species diversification shrank. Today, this once successful family is reduced to just one species growing in the cool cloud forests of central Japan at elevations of 1,500-3,000 feet. Enthusiasts and collectors of unusual and historical specimens consider the Umbrella Pine a “living fossil”. A living fossil is any living species of plant or animal with no known close relatives outside of the fossil record. Growing a living fossil in the home garden is one way to help preserve rare or endangered plant species since it increases their geographic range. Other trees that are considered “living fossils” include the ginkgo (Ginkgo biloba), Dawn Redwood (Metasequoia), and Monkey Puzzle Tree (Araucaria araucana). Francis Parkman, a Boston historian with a passion for gardening, was the first to grow this conifer outside Japan. In 1861, he was sent the first Umbrella Pine - along with the first Japanese maples to be grown in America - by George Hall, an Oriental trader. Parkman named this unusual conifer Japanese Umbrella Pine because the whorl of stiff flattened needles at the end of each shoot resembles the spokes of a Japanese umbrella. Although the Umbrella Pine has a narrow growing range (Zones 5-7), it is an ideal tree for much of New England. It enjoys moist, acidic, well-drained soil, full to part sun, a sheltered location, and is not subject to diseases or pests. In nature, it grows as a 120-foot tall tree with a dense, symmetrical growth habit and reddish-brown bark that exfoliates in shreds. In the garden, it is very slow growing - often making only 6 inches of growth a year to a height of 25-40 feet. The luxuriantly rich evergreen needles are 2 to 5 inches long. As the tree ages, 3- to 6-inch-long oval-shaped, brown pine cones will appear. Even the pine cones are slow growing – they take almost two years to mature after pollination. Because of its slow growth rate, the Umbrella Pine can be used in rock gardens. It makes a unique addition to the home landscape as a specimen or lawn tree, or even as part of a foundation planting. Attractive, unusual, but somewhat pricey, this long-lived conifer will be a prominent focal point in any garden setting. My own Japanese Umbrella Pine is less than 18 inches tall, and currently invisible thanks to the many snowstorms we’ve had this winter. My husband is an avid fossil collector who dreams of establishing a dinosaur museum someday and I have promised to landscape the museum with a Triassic period garden. Perhaps my Umbrella Pine will be large enough to feature as a specimen by then.